Delta SubSea LLC (DSS) signed a long term charter on DP II IMR Support vessel VOS Sympathy for international scopes of work. DSS mobilized two FMC Technologies Schilling Robotics HD 150 HP systems, complete tooling, and full survey suite provided by UTEC Survey. 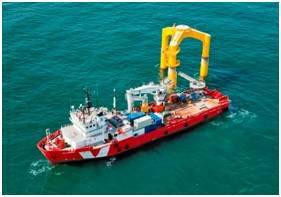 VOS Sympathy will be based out of Trinidad & Tobago and will operate as an ROV platform and light construction vessel for two projects, supporting the operations of a pipe layer. “I am excited about this vessel charter as it allows DSS to respond quickly to our clients’ needs in remote locations that require “Best in Class” ROV support services,” said Scott Dingman, Delta SubSea’s President – CEO.